The DVF-L700 colour HD digital viewfinder offers LCD quality for CineAlta cameras with a digital interface, such as the PMW-F55 and PMW-F5. The compact 7-inch (viewable area, measured diagonally) LCD viewfinder enables high resolution when shooting in 2K and 4K, not to mention pixel-for-pixel 1920 x 1080 representation of your HD images. In addition to the digital interface, the viewfinder has a 3G-SDI input and 4-pin DC input so it can be used as a monitor with any camcorder with a HD-SDI output. The viewfinder also comes with False Color function*, which helps users to adjust proper exposure easily and speedily. * Requires free Version 1.1 firmware upgrade or above and PMW-F55/F5 Version 2.0 software upgrade or above. 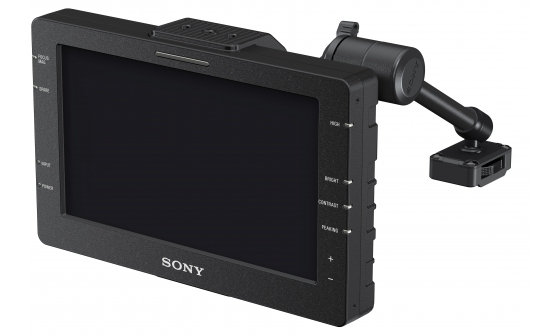 The viewfinder uses a 7.0-inch Full HD resolution LCD panel for a resolution of 1920 x 1080 and a wide visual angle. 26-pin digital viewfinder interface, works with PMW-F55 and PMW-F5. Connects to any camcorder with a HD-SDI output. The LCD screen offers 1000:1 contrast ratio, 10x higher contrast than previous similar size LCD panels. The LCD screen provides stable images without distortion, regardless of the display’s brightness. The High Bright function button increases the brightness instantly to improve visibility even under bright conditions. Bright 300cd/m2 screen and 850cd/m2 in High Bright mode. Works on S-Log2 Gamma (Custom mode) or S-Log2 MLUT (Cine-EI mode). Helps users to adjust proper exposure easily and speedily. When you press SPARE button on VF, 6 colours are displayed on VF to indicate the exposure levels of the image. In order to use this function, the DVF-L700 needs to be updated to Version 1.1 firmware or above. It only works with Version 2.0 of the PMWF55 and PMW-F5. The supplied arm enables easy attachment to the camera to be used by the camera assistant or focus puller without any additional accessory. The viewfinder is equipped with a single tally indicator (red) that lights in response to a tally signal. You can magnify the height and width of the image (x2) for easier focus adjustment.